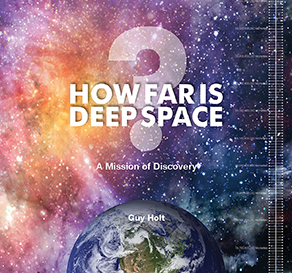 A comprehensive list of sources used in the making of How Far is Deep Space? The measurements in this book are indicative only. The heights or altitudes of many features or objects, natural or artificial, vary in time and due to a range of factors, including seasonal variations, when the measurement is taken and the latitude the measurement is made from. There can be considerable variation in the perihelion, aphelion and average measurements for any celestial body. Authoritative sources differ in the measurements they provide and these measurements are updated by these sources when new scientific information is made available. I have chosen the figures that best fit the story that I am telling in this book in ways that young readers will best understand and remember. Near the Earth I have often chosen maximum measures for natural phenomenon as they are often being compared on page to records achieved by humans or records for wildlife. Numbers: As distances in space can be incomprehensibly large, along with the fact that most celestial objects are in constant motion, we have chosen to round figures for the benefit of the reader. The discrepancy in exactitude becomes more evident the further the reader moves away from Earth, as distances move into the millions and billions of kilometres. Rounding has been done to a maximum of two decimal places. Atmospheric layers: Finding definitive figures regarding the layers of Earth’s atmosphere proved problematic. As mentioned in the text, the height and range of these layers can vary for a variety of reasons. For the sake of convenience we have chosen even numbered maximums (20, 50, 90, 600 and 10,000) as indicated by a variety of sources. Artificial objects orbiting the Earth: For the sake of consistency, we have chosen to use the apogee distance of artificial objects that are orbiting/have orbited the Earth. Planets: When calculating the distance of planets from Earth, we chose the semi-major axis figures as given by NASA on 25/04/14. As celestial bodies are in constant orbit around the Sun, and for the sake of the reader’s comprehension, we decided to place all planets and the Sun on a single, straight line in order to reach our final calculation. If you have any further questions about the book, please contact us at admin@wdog.com.au.